“We are driving from Tirana in Albania to Prizren in Kosovo. Ever on the alert for a fishy meal and a travel story, an hour out of Tirana we reach the shores of Patok Lagoon and spot a man perched high up on a wooden frame at the edge of the water. The wooden structure is reminiscent of the fishing nets used in Cochin in Kerala in India however these appear to be operated from the top of the frame rather than from the ground. We follow a sign to the ‘Restaurant Brillant’ and find a large hut built on stilts out over the Lagoon. We park and meet Ealdi, a fisherman delivering seabass known as ‘levrek’ in Albanian. These are highly prized and Ealdi hopes to get a good price for them. 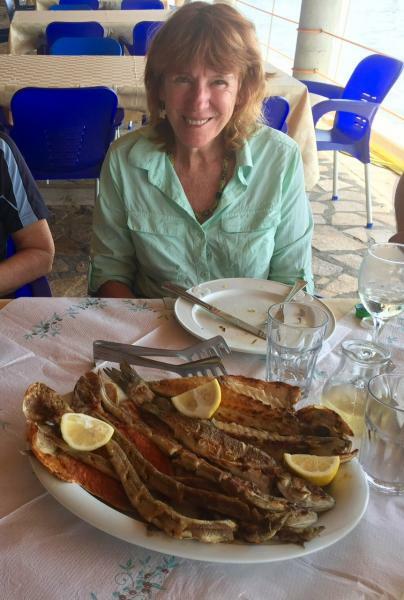 We seat ourselves at a table near the lagoon and the waiter welcomes us with a large platter of fresh whole fish. We must choose those we want grilled for our lunch. Our guide Florian, promotes the eel – ngjale in Albanian, and against our better judgment we choose the eel and a tailor (cafer), a brim (koce) and of course one of Ealdi’s levrek. We shake our head at the mullet expecting it to be too strong. The fish arrived grilled to perfection – the flesh coming cleanly away from the bones. The eel is declared our favourite. Along with delicious white wine, icy cold mineral water, salad and grilled vegetables, we devour the fish with a traditional local delicacy -cornbread topped with baked yoghurt and cheese. Jacqueline Hagan was temporarily distracted from the pursuit of herring while she pursued a career as a psychologist and management consultant. Along the way, she married a geologist who also happened to love fishing and, together, they set off to discover the world. Several years later, she and the fisherman returned home to Western Australia with their two sons, where they handed down the pursuit of herring to the next generation. Jacque now lives in Fremantle, where she and the fisherman spend each summer on their boat at Garden Island. In winter they travel to Europe and South America, in search of new and exciting recipes for the next summer’s herring catch. Her book, Hooked on Herring, is available at our online store. A big feed of herring (known as tommy ruffs on Australia’s east coast) is an intrinsic part of beach holiday nostalgia for thousands of Aussies. Now you have the perfect collection of recipes from around the world, catering for all palates, including the kids – you won’t ever hear them saying NOT HERRING AGAIN!